I am heading toward another Whole30 journey for the month of September. 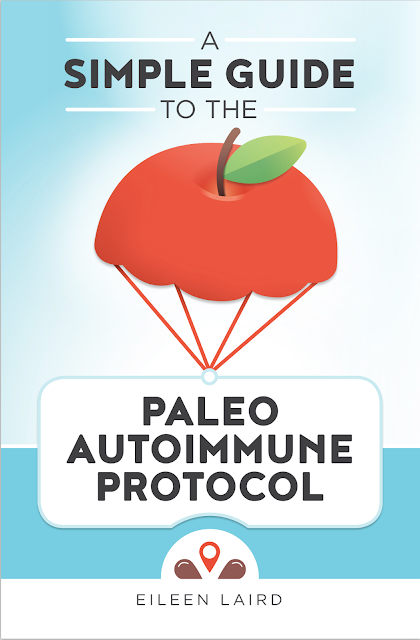 This time I am adding the AIP (Autoimmune Protocol) restrictions. I just finished this book to help me with my planning. Eileen Laird is the AIP blogger at PhoenixHelix.com. This is not an all inclusive guide but it is very helpful for those who are starting and want to understand more about the Autoimmune Protocol for reducing inflammation in the body. If you have an autoimmune disease/disorder then you, likely, suffer with some kind of inflammation on a regular basis. I have Lupus (SLE) and Fibromyalgia and my biggest battle seems to be with the arthritis that comes with it. I have triggers that are external such as the rise in barometric pressure, excessively hot summer days, lack of sleep, and overexertion. I have food triggers, too, that I discovered last May (2015) during my last Whole30. I struggle with soy, wheat, corn, dairy and a whole slew of preservatives and chemicals found in many prepackaged foods. Since May 2015 I have struggled to keep those things out of my diet and have found that I seem to be sensitive to the nightshade plants as well. I need to be back on track after all the crazy summer eating while we were traveling and dealing with a bazillion changes in our lives as a family. Well, maybe not a bazillion... but it felt like it. The book gives a good overview of what you should NOT be eating and then an extensive list of things you can eat in abundance. It gives you helpful information for setting up your kitchen before you begin.... which is what I am doing this next week. It gives you a basic grocery list, how to deal with spices that may be causing issues and how to make your own blends. She addresses eating out at restaurants and travel tips, and my favorite... HOLIDAY EATING! She encourages you to write everything down. Keep an eating journal and a symptom journal as you go. She even shares common mistakes and how to troubleshoot as you move through the changes you are making. I wish there had been a more extensive list of resources because I know they exist but she really just shares things from her website and a few friends that she has worked with in this realm. She has loads of personal experience so it is all great information. The book is very practical and can help you right away as you start your journey to feel better. I will be using this book in conjunction with the Whole30 book and website resources and It Starts With Food from Dallas and Melissa Hartwig. I highly recommend everyone read It Starts with Food before you dive into the Whole30 plan. Something you need to remember is that this is not a diet to be sustained longterm. It is meant to be a 30 day elimination plan. Once you get the junk out of your system you start reintroducing things back in. The goal is to see how you tolerate them until you build a healthy eating plan for you that does not trigger inflammation and sickness in your daily life. I will be sharing, in the coming days, about two other resources I will be using through this, too. They are from Amy Myers MD and address Autoimmune and Thyroid issues specifically so stay tuned for those resources. She certainly warrants a separate post. Not entirely sure I could give up nightshades. Peppers, yes (so after roasting all those hatches, you won't eat any?). But potatoes and tomatoes? Potatoes, maybe, though I love fried potatoes/hash browns. The half Sicilian side of me would die without tomatoes. Though really, I very rarely have them fresh; usually, I'm using canned tomatoes in a dish. I need to get back to keeping a food journal. Even if I'm not following a specific eating plan, the act of writing things down provides the motivation to make better choices.